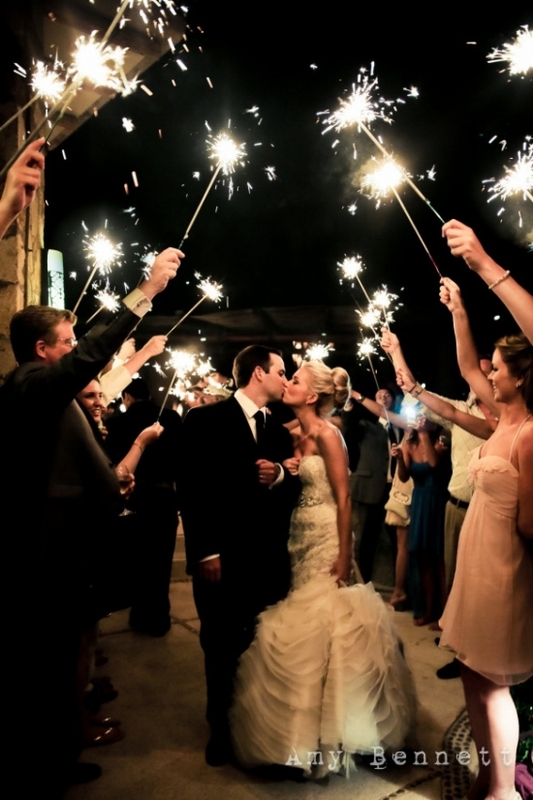 Sparklers for weddings provide a beautiful exit to a perfect day. 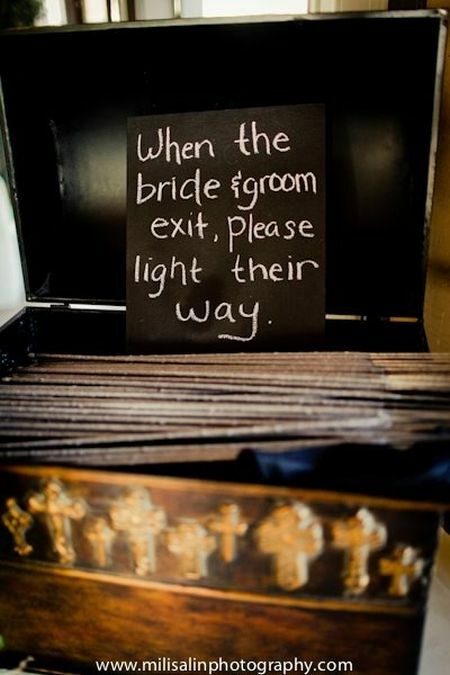 As more couples plan every last detail of their weddings, a grand exit should not be overlooked. 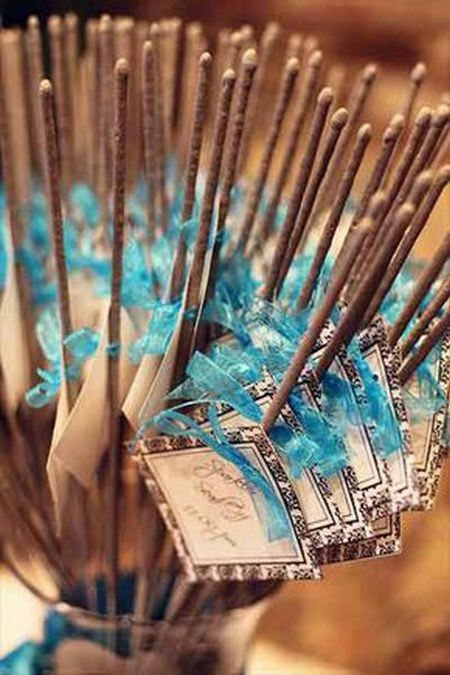 Sparklers add an elegant touch to your wedding finale as well as another opportunity for your photographer to capture some breath taking photos. 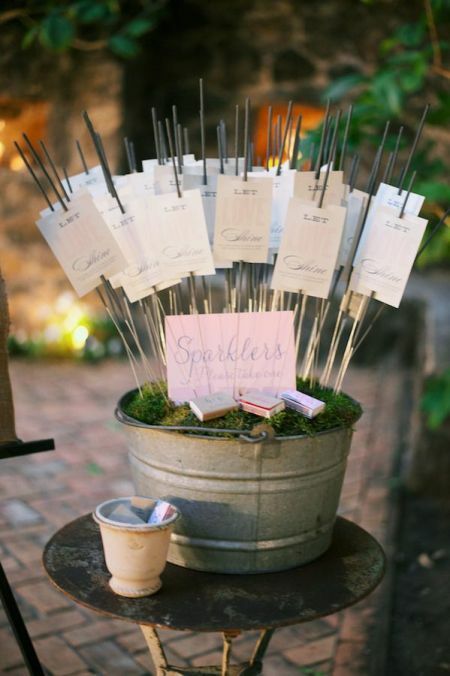 A sparkler send off is a beautiful and fun way for guests to participate in a final farewell and leaves a lasting impression. 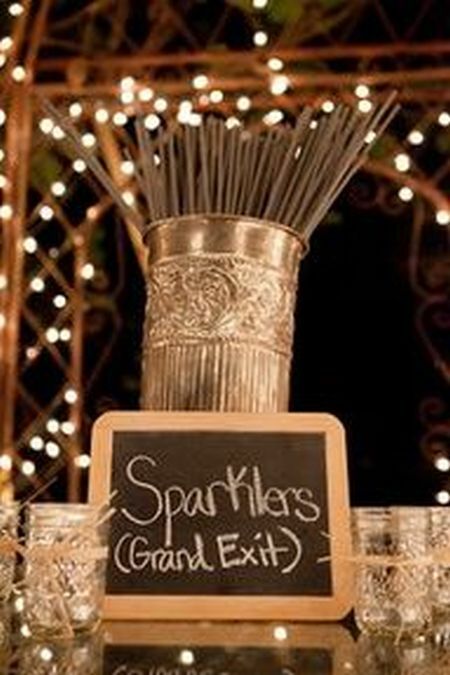 Put a sparkle in your celebration exit with sparklers for wedding. Although sparklers provide a romantic atmosphere for your grand exit, it's important to observe a few safety tips. best light. Consider these tips to keep it safe. Appoint a responsible people to be in charge of the lighting and the send off. Allow plenty of room for your exit forming two lines with ample space for the couple to make their way through the line. Light one sparkler at a time, never a bundle. Caution guests to keep lit sparklers at arms length away from their body or people nearby. Buy the right size sparkler. Bigger is better because of the time involved to get the sparklers lit. We suggest the 20" or 36" sparkler. 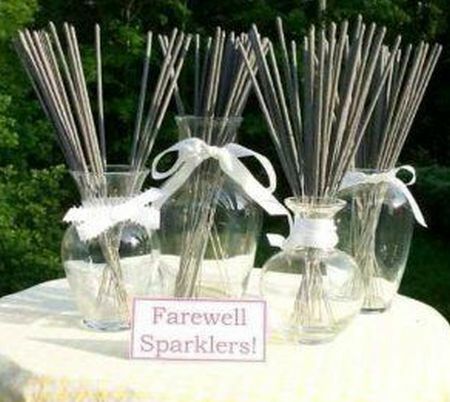 Provide a safe place to dispose of used sparklers. A pail filled with sand or water is a very good option. 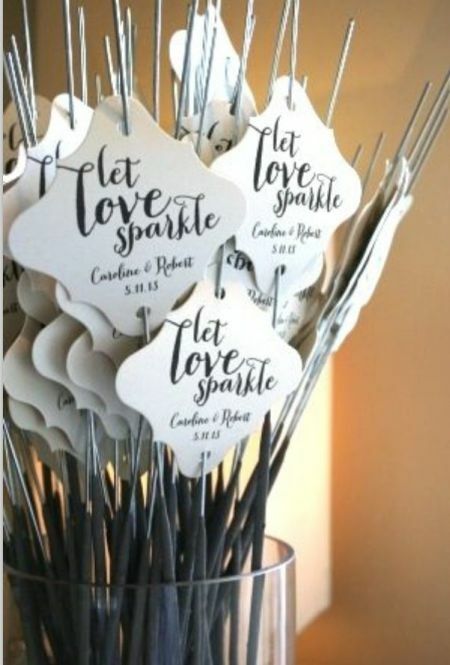 Lots of different ways of putting a unique stamp on sparklers exists, whether a pretty container or a personalized tag. The small details are certainly worth it. 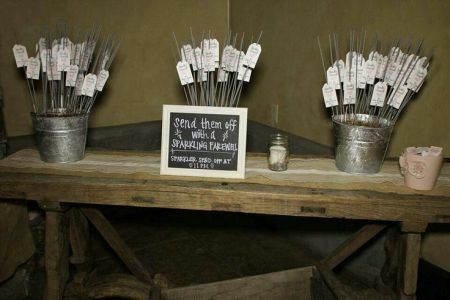 Give guests a sign stating the time of send off. 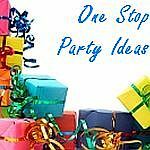 Then give them everything they need to participate in the grand finale like plenty of personalized matchbooks. Setting up a few containers of sparklers in strategic locations is a good idea. Be sure to place near the grand exit. 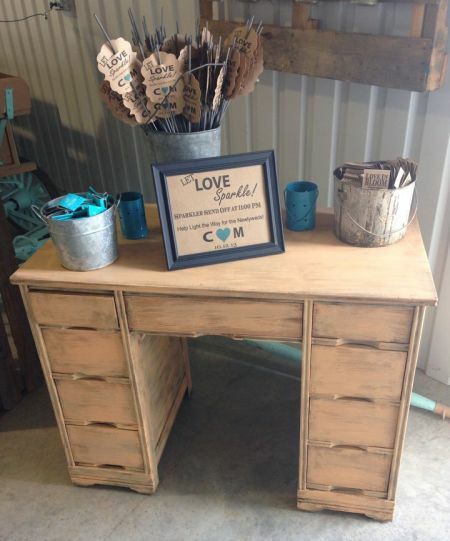 Create a rustic scene that brings all the elements together. This cheerful assortment continues the wedding color scheme outside. 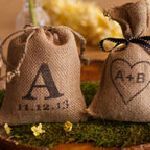 Have some fun thinking about what design elements are important to you and how to infuse them into your wedding reception. 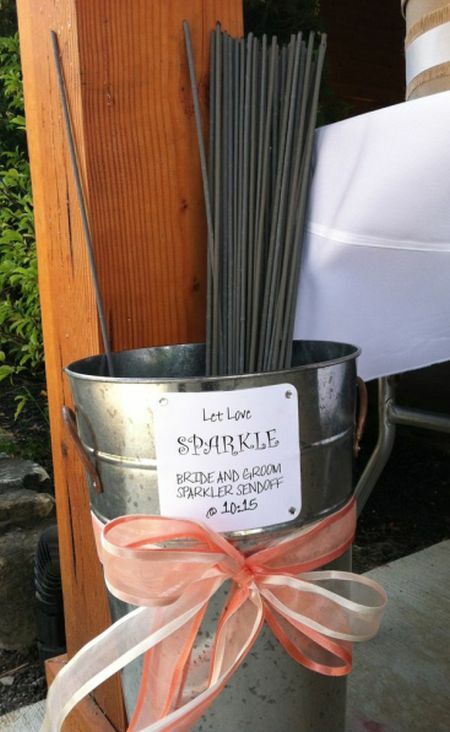 These galvanized pails filled with sand are a great way to display sparklers for weddings. 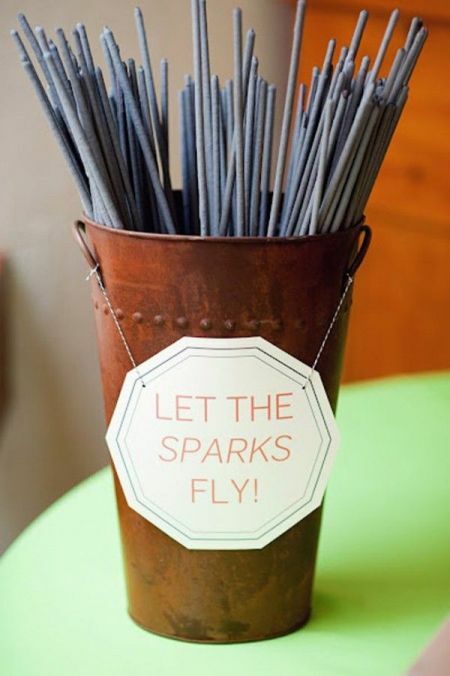 After the send off, guests will have a safe place to put their hot sparkler. Once in a lifetime moments are just that, so celebrate every creative opportunity. 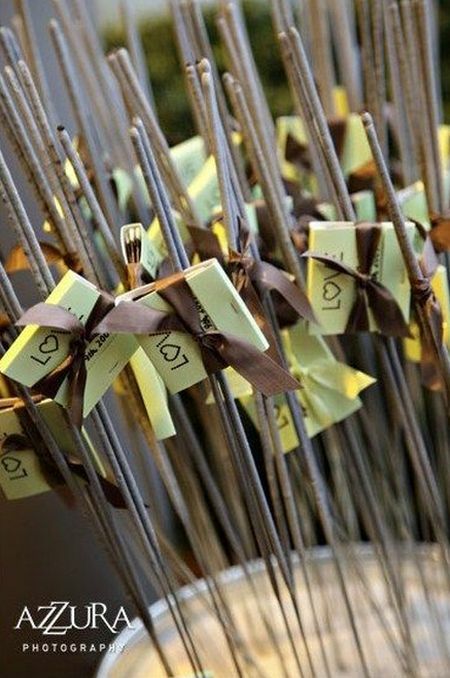 These simple tags etched with lettering and attached to sparklers with a small hole are great examples of making the most of presentation. Light the way for the newlyweds. 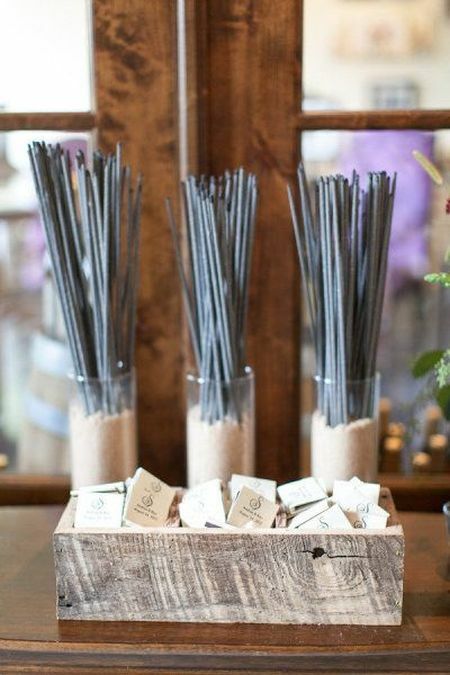 Demonstrate your creativity with a cohesive display of all things rustic. 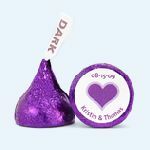 Splashing the wedding color in a small way throughout the design is the common tie. 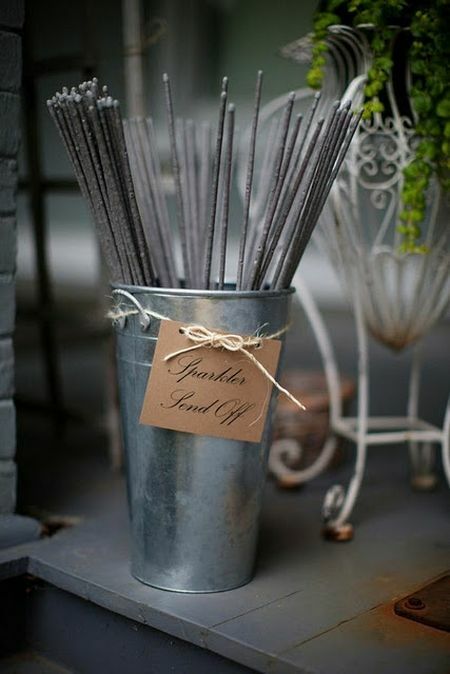 An elegant sparkler presentation is an upscale addition to the reception decor. Simply styled layers achieve the optimum degree of design. 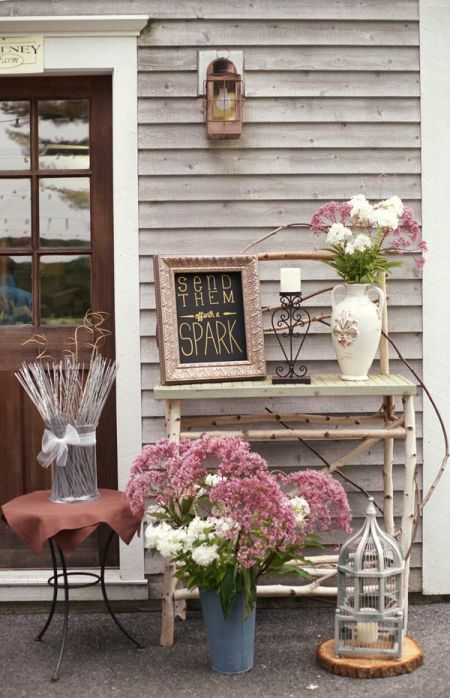 The burlap runner is the perfect backdrop for this casual sparkler display. 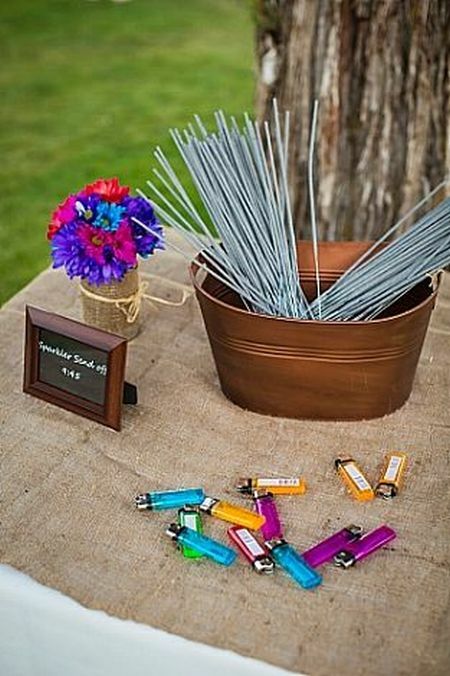 Inject personality into neutrals with vibrantly colored lighters and flowers. Posting the send off time ensures a successful exit. A grand display for the grand exit. This metallic container filled with sparklers stands tall in front of the reflective lighting dancing in the background. On a lighter note, grouping together everything needed is a clever idea. 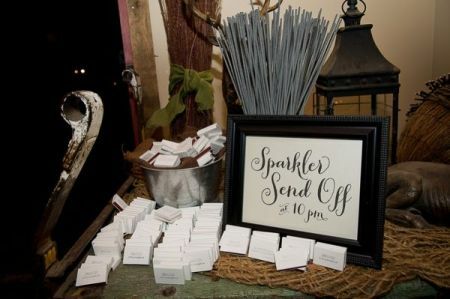 Here you have the sparkler and a customized matchbook all tied with a pretty ribbon ready to glow. A well designed presentation will never go out of style. 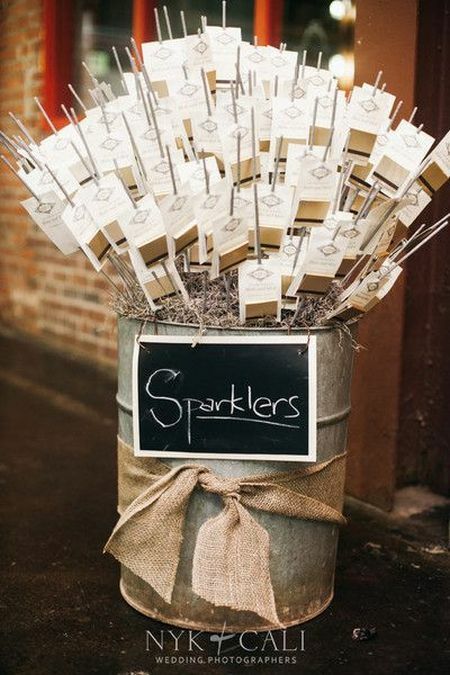 This simple box filled with sparklers and a handwritten sign makes a big statement. 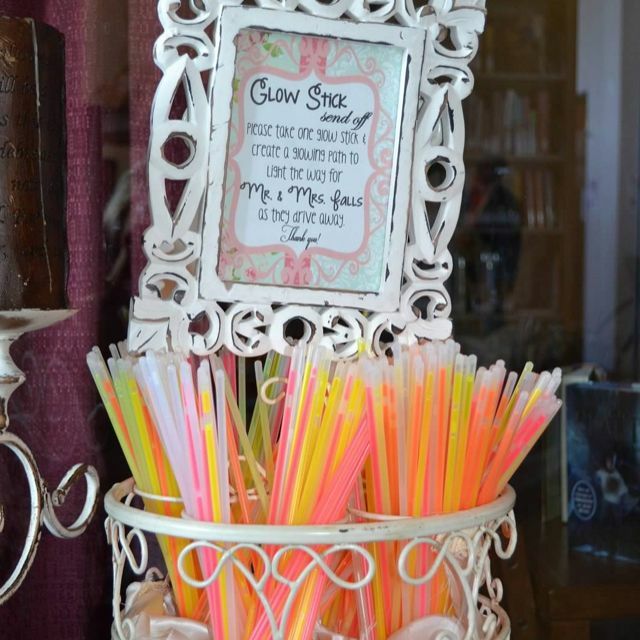 Tradition with a twist: if your venue does not allow sparklers, consider glow sticks. 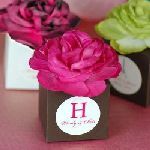 You'll discover that this alternative looks good and can be just as visually effective.